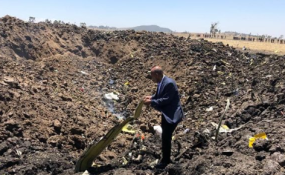 In a typical headline when it comes to reporting on Africa, CNN tweeted, "Ethiopian Airlines was world-class brand with a great safety record until the flight ET302 crash put its reputation in jeopardy." The CNN headline comes a few days after The Washington Post and The New York Times made similar remarks exonerating Boeing and tarnishing the airline instead. The New York Times headline on 21 March 2019 read, "Ethiopian Airlines had a Max 8 simulator, but pilot on doomed flight didn't receive training." There is no denying that CNN, The New Yorker, The New York Times and Financial Times, among a host of other Western media houses, have a singular and seemingly agreed on mono-perspective on how to write headlines that have to do with Africa. The response from Africans has been quick, with many on Twitter exposing the Western press's charade. A tweet from Kayode Ogundamisi in reaction to CNN's headline read, "@CNNAfrica let us fix the headline for you. @flyethiopian is a world-class brand with a great safety record until American @BoeingAirplanes almost crashed its reputation by selling dangerous airplanes to its clients across the globe leading to mass killings of innocent travellers." Social media has played a crucial role in the pushback against the narrative propelled by the Western press in its attempt to tarnish the Ethiopian Airlines brand. A cross-check on Twitter, typing the words "I will fly Ethiopian Airlines", reveals that for many Africans Ethiopian Airlines, the fastest growing and most profitable airline in Africa, is still the place to go. Ethiopian Airlines Group CEO Tewolde Gebremariam told FANAB in a press briefing, "We are ready to take all the necessary legal measures against those media institutions." Ethiopian Airlines has been running for the past 74 years.